Phase analysis has been validated to measure left ventricular (LV) dyssynchrony from resting gated SPECT myocardial perfusion imaging (MPI). In 1-day rest/stress protocols, often only post-stress gated data are acquired. The purpose of this study was to determine whether LV dyssynchrony parameters measured at post-stress significantly differ from those measured at rest. Sixty normal subjects, 40 patients with stress-induced ischemia but normal LV function, and 29 patients with LV dysfunction were included in this study. All patients were scanned using a 2-day Technetium-99m sestamibi (MIBI) MPI protocol, where gated SPECT data were acquired at 60 min post injection of the radiotracer. LV dyssynchrony parameters at post-stress and at rest were calculated and compared using paired t-test. There were no significant differences in the LV dyssynchrony parameters between post-stress and resting in all cohorts. No patient showed differences in the LV dyssynchrony parameters between the post-stress and resting scans significantly greater than the reported variations in these parameters between serial resting scans. There was no significant difference in dyssynchrony parameters measured at rest and 60 min after stress on MPI gated images. Metabolic bone disease due to hyperparathyroidism is characterized by increased bone resorption and new bone formation. 99m Tc- hexakis-2-methoxyisobutylisonitrile ( 99m Tc MIBI) accumulation is controlled by metabolic function and cell viability. To investigate, for the first time, the potential of whole body 99m Tc MIBI scan for detecting, visually and with the aid of quantitative analysis, bony changes associated with hyperparathyroidism. Eighty-six patients with hyperparathyroidism, referred routinely for parathyroid localization, were included in this case-control prospective study. Each patient was injected with 20-25 mCi of 99m Tc MIBI. Routine anterior cervico-thoracic images were obtained for parathyroid localization. Two extra whole body images were acquired and assessed visually and by drawing regions of interest over the mandible, sternum, femur, humeri, spine, and the soft tissue adjacent to the bone. The ratios of bone to soft tissue were calculated and compared to ratios drawn in a control group routinely referred for cardiac imaging and injected with 99m Tc MIBI, after confirming the absence of any bone disease. The visual interpretation of the scans showed 48 patients to have increased bone uptake. Quantitative assessment showed significant difference between the mean ratios of the case and control groups. 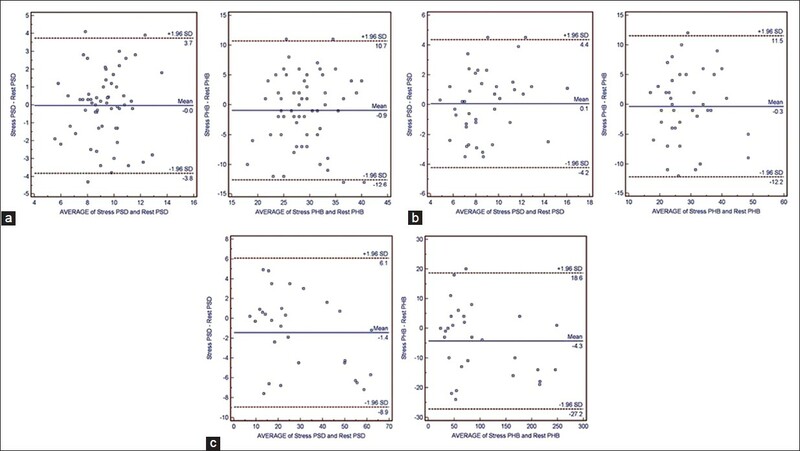 The Kruskal-Wallis test showed significant agreement between visual and quantitative ratios drawn from delayed right and left femora and left humerus images (P < 0.05). 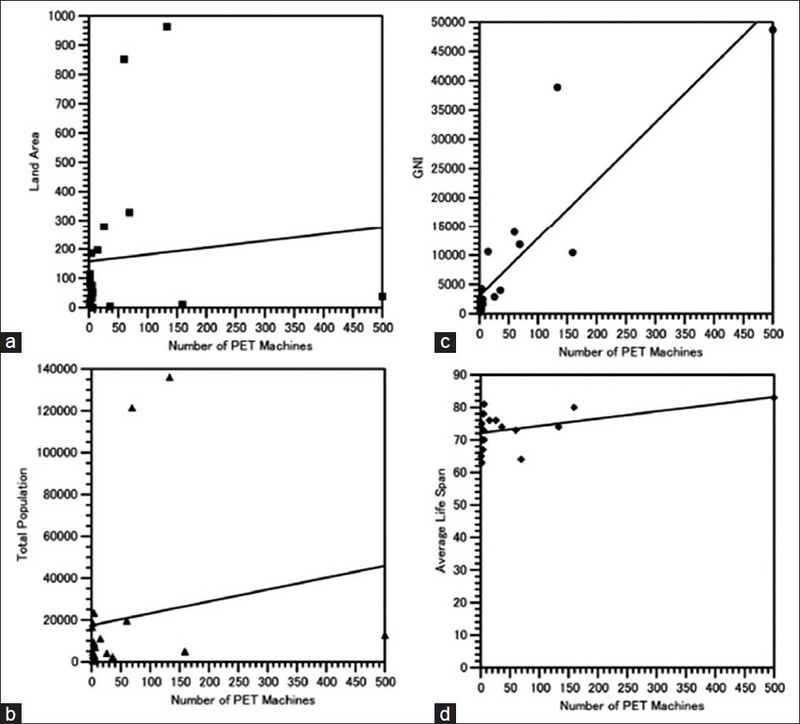 99m Tc MIBI whole body imaging is a potentially useful technique for assessing metabolic bone disease associated with hyperparathyroidism. Quantitative analysis helped in confirming the visual findings. While bisphosphonates are indicated for prevention of skeletal-related events, radionuclide therapy is widely used for treatment of painful bone metastases. Combined radionuclide therapy with bisphosphonates has demonstrated improved effectiveness in achieving bone pain palliation in comparison to mono therapy with radionuclides or bisphosphonates alone. However, there are conflicting reports as to whether bisphosphonates adversely influence skeletal uptake of the bone-seeking radiotracers used for therapy. Recent studies analyzing influence of Zoledronic acid on total bone uptake of Samarium-153 EDTMP (Sm-153 EDTMP) by measuring cumulative urinary activity of Sm-153 on baseline study, as well as in combination with bisphosphonates (administrated 48 hours prior to Sm-153) did not provide any statistically significant difference in urinary excretion of Sm-153 between the two groups. It may be noted that the exact temporal sequence of bisphosphonate administration vis a vis radionuclide therapy has not yet been studied. One of the side effects of bisphosphonates is transient flare effect on bone pain. Radionuclide therapy may also have similar side effect. Keeping in view the above the current study was designed with the main objective of determining the exact timing of bisphosphonate administration in patients receiving combined therapy so as to achieve optimal efficacy of bone pain palliation. Ninety-three patients suffering from metastatic bone pain who received combination therapy with Sm-153 oxabifore (an analog of Sm-153 EDTMP) and Zoledronic acid were divided into three groups according to the timing of Zoledronic acid administration: Group I: 39 patients who received Zoledronic acid 7 or more days prior to Sm-153 oxabifore treatment; Group II: 32 patients who received Zoledronic acid 48-72 hours prior to Sm-153 oxabifore treatment and Group III: 22 patients who received Zoledronic acid 7 days after Sm-153 oxabifore treatment. Sm-153 oxabifore was administered to all patients at the standard bone palliation dose of 37 MBq/kg body weight. All patients received Zoledronic acid before and after treatment in standard dosage of 4 mg every 28 days. WB bone scan, CT, and MRI were performed before treatment in all patients to exclude cord compression and vertebral fractures. 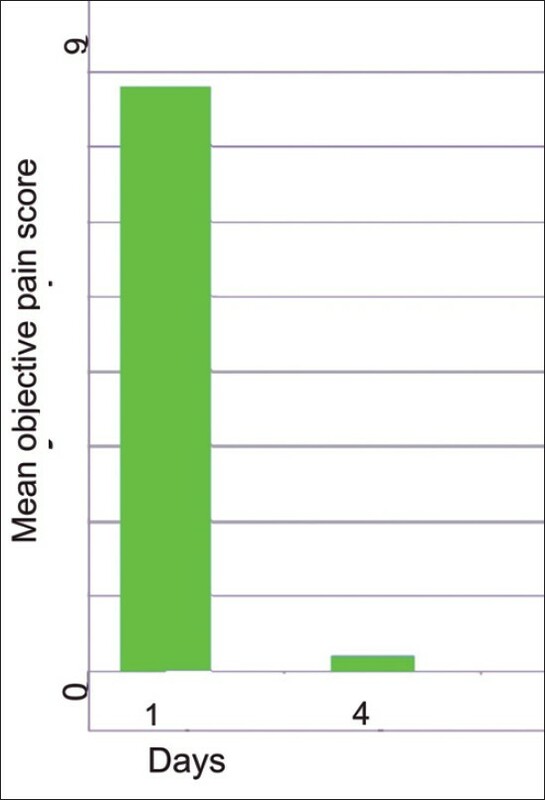 Pain scores and quality of life (QOL) measurements were recorded meticulously in all patients. In groups I, II, and III, pain relief occurred in 10.4 ± 3.1 (Range = 5-15); 3.1 ± 1.1 (Range = 1-5) and 22 ± 5.1 (Range = 15-35) days, respectively, following radionuclide therapy. There was statistically significant difference between pain score in all groups before and after treatment as well as statistically significant difference in time to pain relief onset between Group II and other groups of patients (P < 0.0001). Based on our results we concluded that administration of Zoledronic acid 48-72 hours prior to Sm-153 oxabifore treatment helps in achieving better pain relief, as well as at the shortest time interval from the start of therapy. Breast and prostate cancer have a propensity to metastasize to bones and cause osteolysis and abnormal new bone formation. Metastases locally disrupt normal bone remodeling. 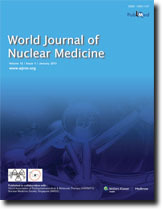 Although metastases from prostate cancer have been classified as osteoblastic based on the radiographic appearance of the lesion, data gleaned from a rapid autopsy program indicate that the same prostate cancer patient may have evidence of both osteolytic and osteoblastic disease as shown by histologic examinations. Thus, bone metastases are heterogeneous, requiring combined treatment targeting on both osteolytic and osteoblastic lesions. While Samarium-153 (Sm-153) oxabifore treatment is widely used for the relief of pain in patients with osteoblastic metastatic bone lesions, Xgeva (Denosumab) is indicated for the prevention of skeletal-related events in patients with bone metastases from solid tumors. It is a fully human monoclonal antibody that has been designed to target receptor activator of nuclear factor-kB ligand (RANKL), a protein that acts as the primary signal to promote bone removal. In many bone loss conditions, RANKL overwhelms the body's natural defense against bone destruction. The main objectives of the current pilot study were to estimate the effectiveness of bone metastases treatment by a combination of Sm-153 oxabifore and Xgeva (Denosumab). Five patients (four female and one male, aged 35-64, mean age 50.8) with multiple skeletal metastases from prostatic carcinoma (1) and breast carcinoma (4) were studied. Their mean objective pain score according to visual analog scoring system on a 1-10 scoring system was 7.8 ± 0.5 (range 6-9). Sm-153 oxabifore was administered at the standard bone palliation dose of 37 MBq/kg body weight. Xgeva (Denosumab) was administered at a dosage of 120 mg every 4 weeks, with the monitoring of calcium level and administration of calcium, magnesium, and vitamin D. Whole body (WB) bone scan was performed before and 3 months after treatment in all patients. 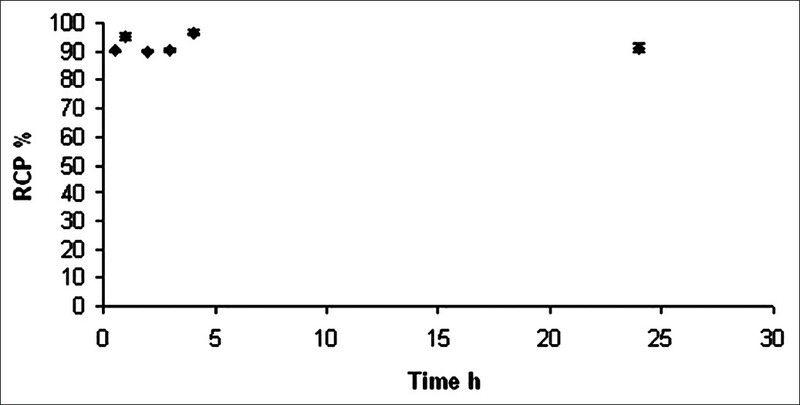 After Sm-153 oxabifore administration, pain relief occurred within 4.4 ± 1.25 days (range 2-9 days) and the objective pain score decreased to 0.2 ± 0.2 (range 0-1). There was statistically significant difference found, according to the pain score system, before and after treatment (P < 0.0001). WB bone scan showed that in one patient, there was significant reduction in the number and intensity of bone metastases, and in four patients, there was no evidence of bone metastases found. Based on our first experience, combined treatment of bone metastases with Sm-153 oxabifore and Denosumab is effective and safe. Nanomedicine is considered as the future of modern medicine. Hence, serious global efforts are being made for the development of nanopharmaceuticals. Among all the nanopharmaceuticals developed so far, radiopharmaceuticals constitute only a very small portion, as noted in the published literature. The procedures for development of nanoradiopharmaceuticals are complex. In this paper we discuss the results of a research directed at developing nanoradiopharmaceuticals based on three different types of nanopharmaceuticals as alternative drug delivery systems. The amplification of HER2 gene has been described in several tumor types, mainly breast cancer with a subsequent increase in HER2 protein expression. Trastuzumab is a humanized monoclonal antibody that recognizes selectively the HER2 extracellular domain. The objective of the present work was to standardize the conjugation of Trastuzumab with Succinimidyl-hydrazinonicotinamide (HYNIC) and labeling with 99m Tc to obtain 99m Tc-HYNIC-Trastuzumab for use as in vivo tracer of the HER2 expression in breast cancer. The labeling procedure involved derivatization of 0.067 μmol of Trastuzumab with 0.33 μmols of HYNIC in dimethyl sulfoxide (DMSO). The mixture was incubated for 30 min. A mixture of Tricine and SnCl 2 .2H 2 O was prepared by add a solution of 44.6 μmols Tricine in 0.05 mL HCl 2.0 M and a similar volume of another solution containing 44.3 μmols SnCl 2 .2H 2 O in 0.5 mL HCl 2.0 M. Then, 0.05 mL of this mixed was added to the conjugated with 296 MBq of 99mTcO-4. The final mixture was incubated at room temperature (18-25°C) for 30 min. Radiochemical purity of the labeled solution was studied by chromatography, to evaluate 99m Tc-Tricine, 99m TcO 2 .H 2 O, and free 99m TcO 4 − . Radiochemical purity was also evaluated by HPLC. Stability studies were tested in solution at 4°C and lyophilized at 4°C. Biodistribution studies were performed in healthy CD-1 female mice at 2, 5, and 24 h (n0 = 3) and CD-1 female mice spontaneous breast adenocarcinoma (n = 3). 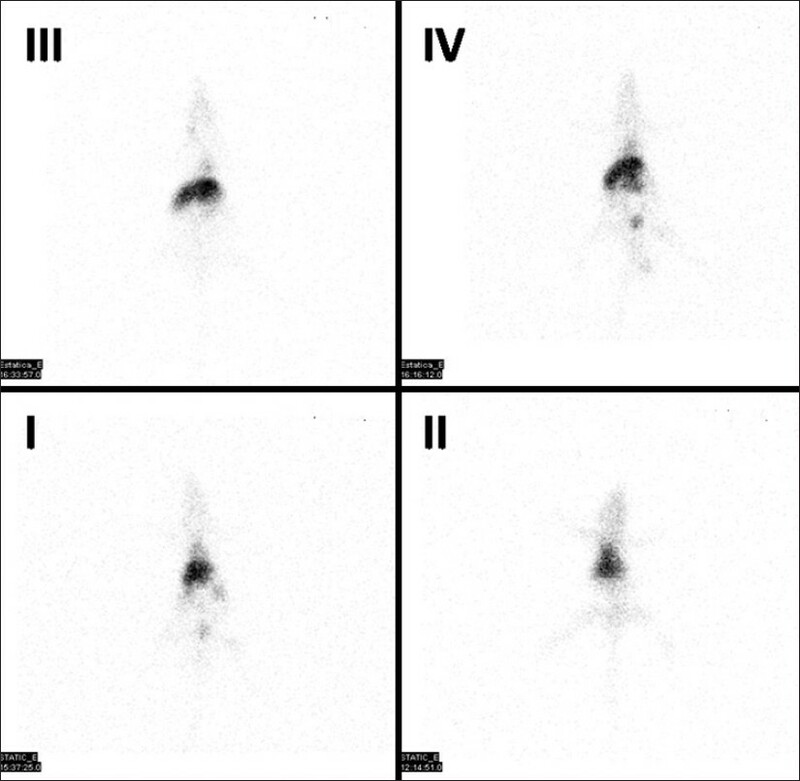 Scintigraphic images of spontaneous breast adenocarcinoma in female CD-1 mice were acquired in a gamma camera at 2, 5, and 24 h post-injection. Labeling was easily performed with high yields (>90%) and radiopharmaceutical stability for 24 h post-labeling. Stability studies revealed that antibody derivative must be lyophilized for undamaged storage. Biodistribution studies and imaging revealed excellent uptake in the tumor. Based on the results it was concluded that 99m Tc-HYNIC-Trastuzumab could be a promising radiopharmaceutical for in vivo diagnosis of the HER2 status in breast with impact on treatment planning. 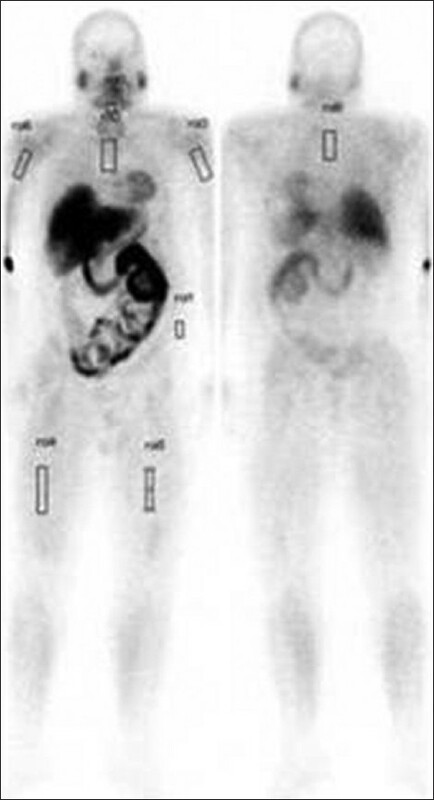 The number of positron emission tomography (PET) machines has been increasing in regions of East-, Southeast-, and South-Asia as well as in Latin America including Mexico. This study was performed to assess the potential requirement of PET machines in 19 countries which already use PET in the aforementioned regions. Data on the number of PET machines and internationally available characteristics of the restrictive countries such as the land area, the total population, the gross national income (GNI), and the average life span of inhabitants were obtained from IAEA, UN, WB, and WHO. Correlation between the number of PET machines and the characteristics of each country was evaluated. The potentially required number of PET machines, which was obtained by adjusting the number of PET machines with statistically significant, correlative characteristics of each country, standardized on the state of Japan, were compared. The number of PET machines could be significantly correlated to the GNI of a country and the average life span of its inhabitants ( P < 0.05). Based on Japan, most of the countries in the regions would require considerably more PET machines. With installation of the potentially required number of PET machines in each of the countries, the number of PET machine per 10 6 population would increase by 1.1- to 12-fold, in comparison with the current situation. With regards to the potentially required number of PET machines, most of the countries in these regions may require a considerable increase of PET machines. 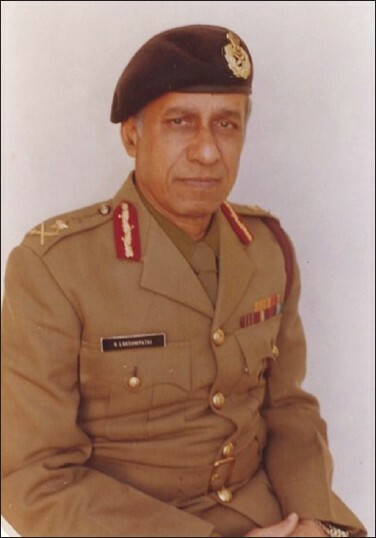 Nevertheless, some countries in the Asia seem to require outside assistance such as international support in order to introduce PET and enhance the efficacy of their health services. The possibility of an ectopic gallbladder should always be considered whenever there is a failure to localize it in its normal anatomical position on routine imaging. Although a very rare entity, the anomalous position of gallbladder can result in misinterpretation of imaging findings and create clinical confusion. Awareness of such an anomaly facilitates proper diagnosis and subsequent management. The authors report a very rare case of suprahepatic gallbladder associated with phocomelia, pancytopenia, and splenomegaly in a young 25-year-old female. The suprahepatic gallbladder was initially visualized on Technetium-99m (Tc-99m) Mebrofenin radionuclide hepatobiliary scintigraphy. Subsequent magnetic resonance cholecystopancreatography (MRCP) was also done to confirm the diagnosis. 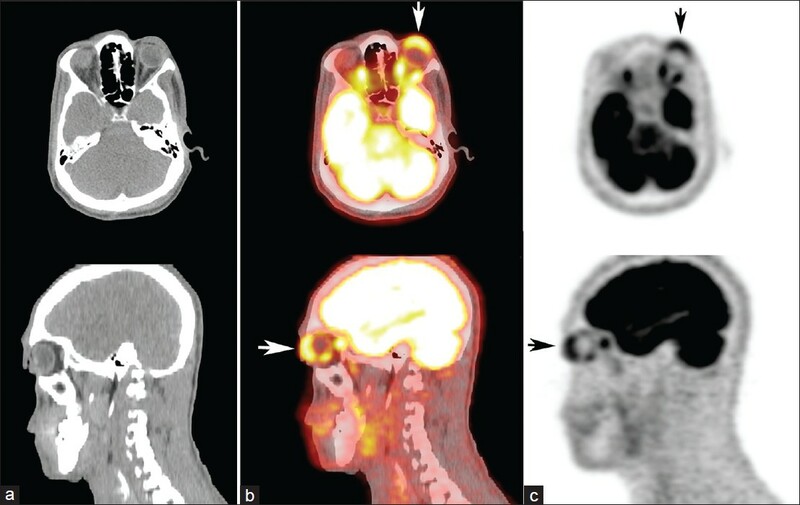 The value of F-18 fluorodeoxyglucose positron emission tomography/computed tomography ( 18 F-FDG PET-CT) for the evaluation of cutaneous melanoma has been demonstrated previously. However, there are few reports regarding the use PET-CT for the staging of conjunctival melanoma (CM). We report here a case, a 34-year-old male with a six-month history of a pigmented nodule at the palpebral conjunctiva of the left eye, and a firm left preauricular lymph node detected on physical examination. Biopsy of the ocular lesion confirmed CM, and fine needle aspiration cytology of the preauricular node was positive for malignancy. CT showed three pulmonary nodules. 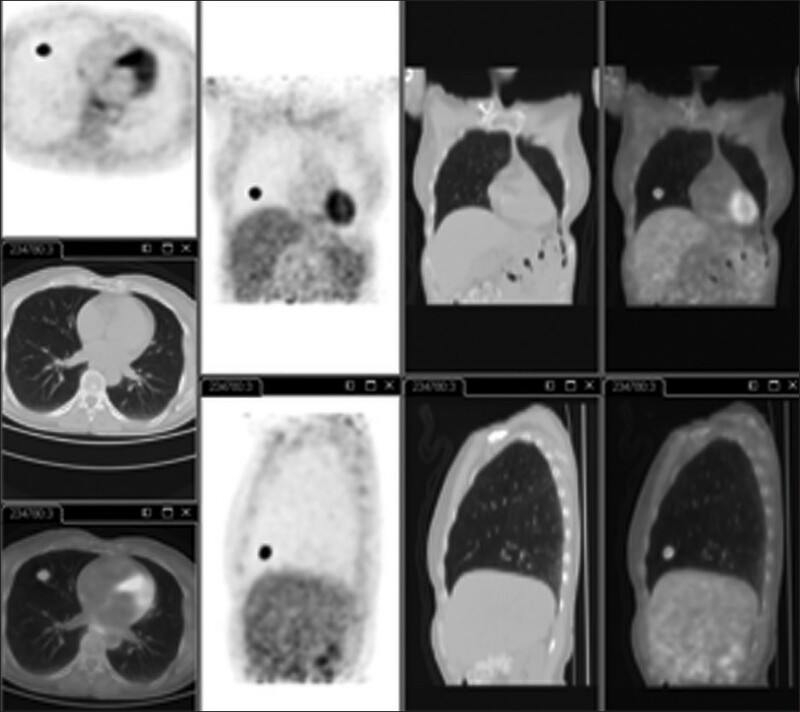 An 18 F-FDG PET-CT was performed to restage the patient. The study showed hypermetabolic lesions in the left eye, and in the left preauricular node. The scan was negative for metastasis. These findings were important in guiding management of the disease in this patient. Future prospective studies should further evaluate the role of 18 F-FDG PET-CT for the staging of CM. Locoregional treatment of hepatocellular carcinomas using yttrium-90 (Y-90) microspheres is an emerging modality, and involves the administration of such radioactive particles directly into the hepatic arterial vasculature. 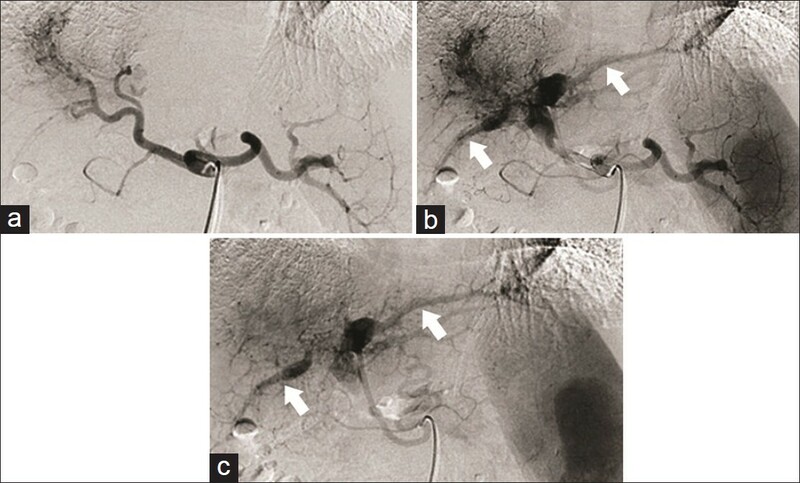 We present the case of a 58-year-old gentleman undergoing evaluation for Y-90 microsphere therapy for hepatocellular carcinoma, in which our findings suggest that significant hepatic arterial portal venous shunting detected during the angiogram maybe a predictor of poor localization of microspheres in the turmor, and that centers that utilize body surface area (BSA) approaches for dosimetry should take note of such findings.